Hello, and welcome to my website. I’m Sandy Rideout, the author of clean romantic comedies for girls of all ages. My latest heartwarming series takes place in a town known for being the best place for dogs and dog-lovers in the world. Each book stands alone, although familiar faces (both human and canine) pop up throughout the series. Expect lots of laughs, a little mystery and a resounding happily-ever-after. 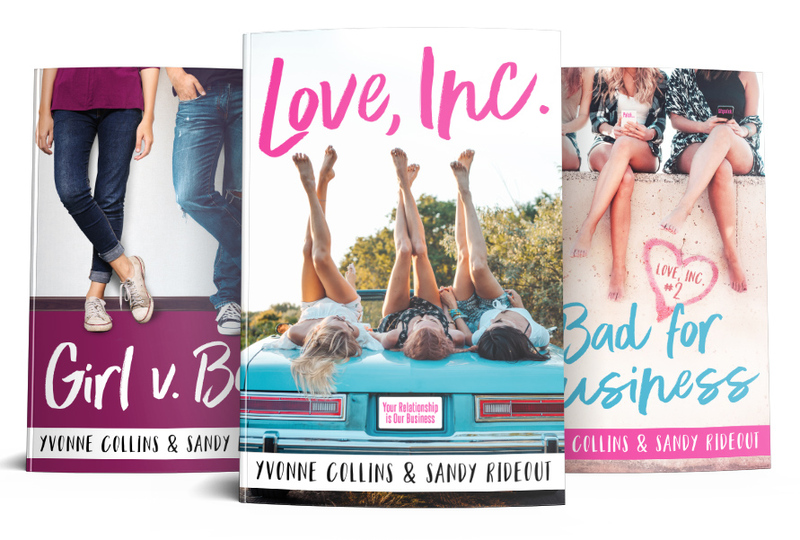 If you enjoy sweet and sassy stories with younger heroines, you’ll love my clean coming of age rom-coms co-written with Yvonne Collins. Learn more about our work at collinsrideout.com. A pet-phobic PR person. A curious cat. A crisis that could bring Dog Town to its knees. Evie Springdale doesn’t exactly hate pets, but she sure doesn’t love them. That’s why her move to Dorset Hills to handle public relations for the dog-crazy town comes as a surprise to Nick, her twin brother and a Dog Town convert. What Nick doesn’t know is that Evie’s lost eight political jobs, eight romantic relationships, and survived eight freak accidents. It’s time for a fresh start and she’s determined to make her ninth life completely different. When she finds an injured cat trapped between the doors of her new house in Dorset Hills, Evie’s feelings about pets are put to the test. And when that cat brings home evidence of a crime that could cause a public relations fiasco, she needs to decide whether to do the right thing … or the job she was hired to do. One wayward cat, two sweet dogs, a handsome veterinarian, a band of community rebels, a brotherly helping hand and an Easter Festival might just be enough to turn Evie’s ninth life into a stunning success. Get your paws on Nine Lives in Dog Town now! One accidental pregnancy. Two people trying to do the right thing. Can their budding relationship survive unexpected puppies? Sasha Wildwood is shocked to discover her beloved pooch, Tuni, is pregnant just days before a delayed spay operation. Accidental puppies send the wrong message in Dog Town—a “careless owner” message. It’s the kind of thing that could destroy a dog groomer’s thriving new business. She sets out to find the puppy-daddy, desperately hoping it’s not the neighborhood’s brawny bulldog. The canine Casanova’s arrogant owner isn’t the only one flouting Dog Town’s neuter policy but he might be the most blatant about it. At least, he is until he has something at stake, too. As Tuni expands, Sasha’s prospects shrink. It’s enough to make her question her choice to start over in Dorset Hills after a nasty split. Will Tuni’s Valentine’s Day delivery break Sasha’s heart again… or give her the second chance at love she deserves? Yours and Mine in Dog Town is part of the “Dog Town” series of romantic comedies. If you like funny, heartwarming stories with a touch of mystery, you’ll love Sandy Rideout’s novels. Buy Yours and Mine in Dog Town now and take a walk on the wild side! Humor and hounds abound in this heartwarming collection of four fun-filled cozy romantic comedies. Dorset Hills is famous for being the most dog-friendly 🐶 place in the world. In Dog Town, the furry rascals, rescues and rogues are at the center of every love story, every mystery and every small-town scandal. This charming series of romantic comedies has just enough suspense to keep you turning the pages till the happily-every-after arrives. Get this lighthearted, clean quartet at a special bundle price today! A Christmas Eve lovers’ quarrel. A frantic search for the perfect, furry gift. Will a Dog Town Christmas miracle be enough to heal the rift? Flynn doesn’t want a new dog. When her beloved shepherd, Majesty, passed away she vowed never again. Maj was the dog of Flynn’s heart and the muse to her art. Six months later, she’s still shaken and her cartooning career is floundering. Husband Denver longs for a new canine companion, especially since Majesty only had eyes for Flynn. More than anything, however, he wants to see his grieving wife happy again. A Christmas Eve spat sends Flynn on an urgent mission to surprise Denver with a new dog. How hard could it be to find a cuddly four-legged gift in just a few hours? It is Dog Town, after all. Friends old and new join Flynn’s frantic and funny search for Denver’s ideal dog. Can the magic of Christmas deliver a minor miracle? Is there a tiny space left in Flynn’s heart for just the right pooch? Calm and Bright in Dog Town is part of the Dog Town series of romantic comedies. If you like funny, heartwarming stories with a touch of mystery, you’ll love Sandy Rideout’s novels. Get Calm and Bright in Dog Town today and let this little holiday gem work its magic on you. She’s the new judge in Dog Court. Someone is out to reveal her fuzzy, four-legged secret. Will rascal Hank cause a big enough scandal to get her fired? Marti Forrester hates saying no, especially to the Mayor of Dorset Hills. So when he appoints her to preside over Dog Court, she reluctantly steps into the robes—even though Hank, her loveable mutt, is the poster dog for poor training. Hank’s crazy antics even caused a rift with husband Oliver. Now Marti is scrambling to cover Hank’s dirty tracks and avoid political mayhem. Can she do some good for the bad dogs of Dog Town despite this canine conflict of interest? When someone threatens to expose Marti and Hank, she digs deep into the secrets of Dog Town’s old guard. The politics turn nasty, giving her exactly the push she needs to say yes to doing the right thing… for Hank, for Oliver, and for Dog Town itself. Tried and True in Dog Town is part of the “Dog Town” series of romantic comedies. If you like laugh-out-loud tales, sweet love stories and enough suspense to keep you guessing, then you’ll love Sandy Rideout’s light-hearted novels. Sink your teeth into this Dog Town confection today! A mischievous mutt goes missing in Dog Town. Is it a prank, or something more nefarious? Can Mim solve the riddle and bring her beloved pup home by Christmas? No one would steal the precious pooch of a dedicated nurse and single mom—especially not in dog-friendly Dorset Hills at Christmas. It’s unthinkable. Yet Mim Gardiner is forced to consider the possibility when George disappears from his own backyard one snowy night. She’s been working overtime and letting things slide on the home front. Is someone trying to teach her a lesson? The dashing new neighbor with the chip on his shoulder has complained about George’s barking. It turns out he’s not the only one with a grudge against Mim’s scrappy little charmer. Still, nobody would deliberately harm George. It would be a crime against all that’s holy in Dog Town. But why isn’t the City taking George’s disappearance seriously? Mim feels lost until a bold band of rebels come to her aid. Can old friends, new allies and a handsome hero help connect the dots and find little dog George before the big day? This page-turner will warm your heart, make you laugh, and keep you guessing right up to Christmas Eve. Get it now! Lost and Found in Dog Town is part of the “Dog Town” series of romantic comedies. If you like heartwarming and hilarious stories with a touch of mystery, then you’ll love Sandy Rideout’s light-hearted novels. Pooches are her passion. Someone is out to shut down her shelter. Can she save her rescues and her home before it’s too late? Bridget Linsmore is a scruffy rebel with a soft spot for four-legged friends. Known as the matchmaker to the mutts, she rehabilitates rescues to help them find their forever home. But to secure her own perfect house, she must make her next rescue dog pageant a success despite a new mayor whose vision for the city doesn’t include the quaint tradition. As her best friend attempts a modern makeover on Bridget and the pageant itself, a series of neighbor complaints throws a wrench in the rescuer’s plans. She suspects the wealthy developer next door but the attraction growing on both sides of the fence is hard to deny. When the complaints turn to deadly sabotage, Bridget has one chance to save her pageant, her home, and her precious pooches before tragedy strikes. A Match Made in Dog Town is part of the “Dog Town” series of romantic comedies. If you like laugh-out-loud tales, delightful characters, and small-town capers, then you’ll love Sandy Rideout’s light-hearted novels. Buy A Match Made in Dog Town and dig up some four-legged fun today! Two unexpected homecomings to a dog-crazy town. A secret that binds three hearts to the past. Can one spoiled beagle sniff out the truth at last? Remi Malone has conquered lifelong shyness with help from Leo, her unofficial therapy dog. The promotion she craves is finally within reach. All she needs to do is land a big donation for the hospital foundation from a visiting heiress. Hannah Pemberton isn’t thrilled about being back in Dorset Hills to open an exhibit of her late mother’s art. “Dog Town” has become a joke and the visit is stirring up old ghosts. She can’t even remember Remi, the hometown advocate. Tiller Iverson broke Remi’s heart in high school and left town 12 years ago. Now he’s back with his annoying dog, using his charm on Hannah to win the donation and the job Remi wants. He only has Labor Day weekend to pull it off. Everyone’s stressed… even Leo. And when Leo’s misdeeds get him barred from duty, Remi’s budding confidence is shaken. She’ll never get the second chance she deserves without her canine sidekick. But in Dorset Hills, where there’s a dog there’s usually a way. Bitter & Sweet in Dog Town is the first book in a series of heartwarming romantic comedies set in a quirky but quaint town where the dogs always steal the spotlight. Just down the hall is Mitch, her hot new TV “brother.” Too bad Mitch wants nothing to do with Kendra or the cameras that have invaded his life. But when Kendra embraces the family’s environmental cause at the aquarium, Mitch starts to thaw. As things heat up between them, Judy, the show’s scheming producer, shamelessly exploits their budding romance for ratings. With over 1,000 5-star ratings on Goodreads, you can’t miss this teen rom-com collection! Sweet, smart and sassy romance that’ll warm your heart and make you laugh out loud.